If someone you know approaches you about having experienced sexual assault, what do you do? 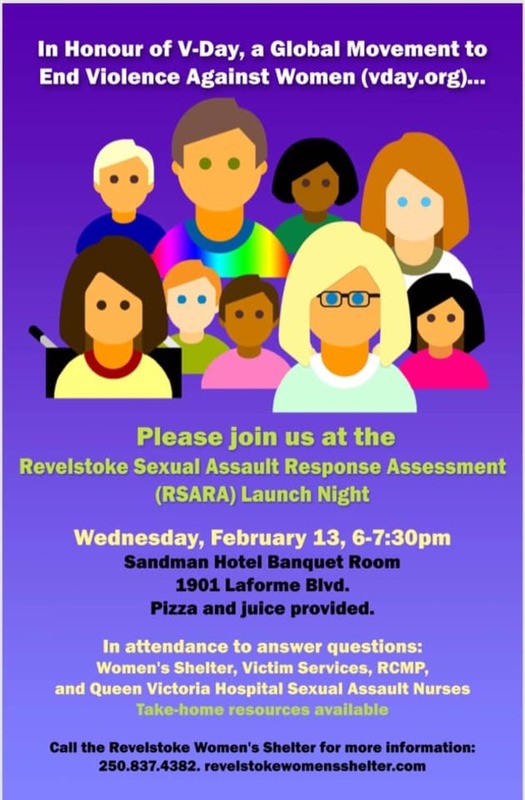 This question will be answered this Wednesday, with the launch of the Revelstoke Sexual Assault Assessment Response. It’s a form that has been created by local services, such as the RCMP, the local hospital and women’s shelter, to report a sexual assault anonymously and will be available on local community websites. Knowing how to respond means you can help make a bad situation that little bit better. The response is essential know-how for everyone, but in particular business owners and those who work at bars who may be approached by staff or customers. The launch is this Wednesday, February 13, at the Sandman Hotel’s banquet room at 1901 Laforme Bvld. There will be pizza and drinks and the session will run from 6 to 7.30 p.m.
RCMP, nurses, and shelter staff will be available to answer questions. For more information, call the women’s shelter on 250-837-4382.